Fifth Wheel Hitches are a special class of hitch that mounts over or forward of the rear axle of the towing vehicle. The vehicle being towed has a king pin on the end of the trailer which fits into the specially designed notch on the Fifth Wheel Hitch. Gross Towing Weight (GTW) - The weight of the trailer plus all the cargo in it. This is measured by putting a fully loaded trailer on a scale. King Pin - This is the attachment at the end of a Fifth Wheel Trailer and the part that connects the trailer to the Fifth Wheel Hitch. 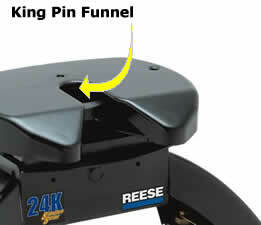 King Pin Funnel - The slanted sides of the groove on the Fifth Wheel Hitch that allows you to back your pickup into the groove and lock the connection between trailer and pickup. King Pin Indicator - Simply put, this is an indication on the Fifth Wheel Hitch that the King Pin of the trailer has successfully seated and is locked into position. Pin Weight Capacity - The amount of the trailer's weight that presses down on the Fifth Wheel Hitch. Pivot - In Fifth Wheel Hitches “side to side” pivot means it will pivot from pickup sidewall to sidewall. The fore to aft pivot means cab to tailgate pivoting. What are the different types of Fifth Wheels? Power Puck - On the Elite Series Fifth Wheel Hitch the mounting rails are under the bed. The Power Puck is where the Fifth Wheel Hitch attaches to the bed and they are bolted to the rails underneath the bed. Rail Kits - They are rails that are securely fastened to the truck bed and are needed to attach a fifth wheel hitch to your truck bed. Slider - The slider is meant for short bed pickups and gives more turning clearance at low speeds and tight conditions. They come in both round tube and square tube models. Vertical Height Adjustment - On the base some Fifth Wheel Hitches have different holes allowing you to adjust how high the base is installed on the legs. Data generated in 0.001047 (s) from 6 queries.